The story in August 1968 spoke to the times and to Bruce Beyer's convictions. The headline, "Protesters, Police Battle in Church," appeared on the front page of the Buffalo Courier-Express in large letters, above photos of the confrontation. "Seven Jailed Along With 2 Resisters." They became known as the Buffalo Nine – Mr. Beyer and his friend, Bruce Cline, were the war resisters – and their arrests drew national attention. Thirty-two FBI agents and federal marshals, backed by 100 Buffalo police officers, came to the Unitarian Universalist Church on Elmwood Avenue to arrest him. 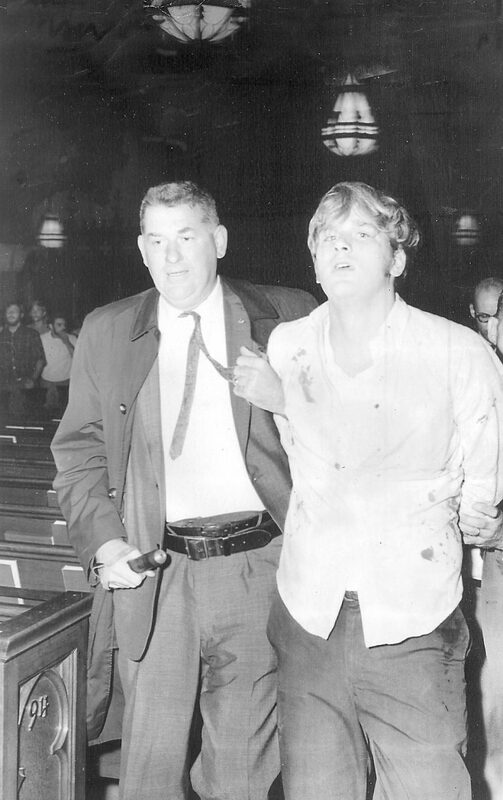 It led to a fist-swinging melee and Mr. Beyer's conviction for assault in 1969. The episode marked a turning point for Mr. Beyer, who died Monday from complications of congestive heart failure in Hospice Buffalo, Cheektowaga. He was 70. It set him on a lifelong course of opposing what he considered the U.S. government's imperialist foreign policy and offering support to those who resisted the military. It also put him squarely on the side of those he considered victims of an unjust social and economic system. Ten months before that confrontation, Mr. Beyer had stood on the steps of the Justice Department in Washington, D.C., to return his draft card during a large protest against then-U.S. Attorney General Ramsey Clark. In August 1968, after refusing to report to the Army for induction, Mr. Beyer and Cline took symbolic sanctuary for 10 days in the Unitarian Universalist Church, where his parents were members, after his father convinced other parishioners to take in the war resisters. After 10 days, the feds arrived. 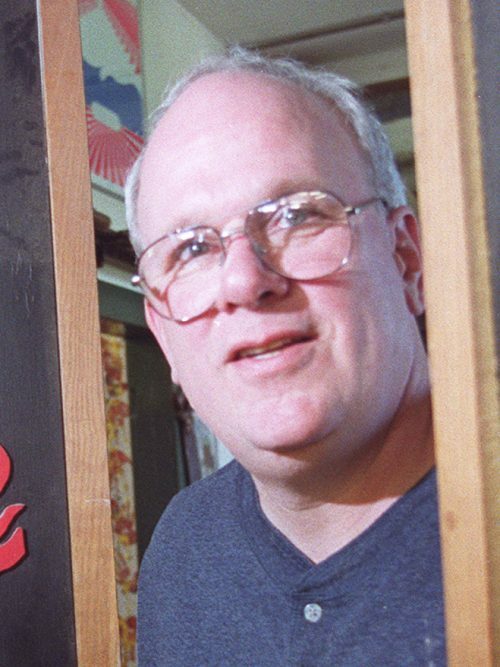 “Bruce had an uncanny ability to inspire people to action with his commitment,” said Bill Berry, a fellow member of the Buffalo Nine who became friends with Mr. Beyer in 1968. “He laid his body and his beliefs and his whole life on the line in dedication to the cause of the anti-war movement and equality,” he said. Mr. Beyer was also a great friend, Berry said. Born in Buffalo, Earl Bruce Lazarus was given up for adoption by his mother, Pamela Lazarus, an unwed teen from Wilkes-Barre, Pa. Seeking to find his biological parents through Ancestry.com in 2015, he discovered through DNA testing that his actual father was a major league baseball player, Joe Tipton, the backup catcher for the Cleveland Indians in the 1948 World Series, who had played for the Wilkes-Barre Barons in 1947. Tipton died in 1994. Pamela Lazarus died in 2012. Adopted by Robert and Elizabeth Beyer, he attended a military academy and graduated in 1966 from Bennett High School. In a commentary in The Public in 2017, he recounted how he worked as a night clerk in the Imperial 400 Motel at Main and Summer streets during the riots on the city's East Side in 1967 and "I drew parallels between the (Vietnam) war and racial injustice." Nevertheless, he recalled, he planned to enlist in the Air Force that summer until he met a woman, an anti-war activist, who convinced him to become a resistor. Two months later, he said, he went to an anti-war demonstration in Washington, D.C., and turned in his draft card. While out on bail, Mr. Beyer gave a speech at the University at Buffalo and was charged with inciting a riot after students destroyed the ROTC offices in Clark Gym. Facing a three-year jail sentence, he fled to Canada and then to Sweden, where he was granted humanitarian asylum. He married his Canadian girlfriend and moved back to Canada, where he lived for five years before returning to the United States to face the assault charges. Mr. Beyer crossed the Peace Bridge back to Buffalo in October 1977, joined by Clark, the former attorney general, and 50 Vietnam vets, including a Marine Corps ex-prisoner of war, who called for universal unconditional amnesty. In the end, U.S. District Court Judge John Curtin, who had allowed Mr. Beyer to attend the Woodstock festival while out on bail in 1969, reduced his sentence to 30 days, with 19 days served. He settled in Buffalo and lived for many years on the East Side above his woodworking shop. He was a stagehand with Local 10 of the International Alliance of Theatrical Stage Employees. In October 2017, Mr. Beyer returned to the steps of the Justice Department in Washington to commemorate his act of defiance there 50 years earlier. "We have not even begun to atone for the genocide committed against native peoples when we invaded their lands," Beyer wrote in The Public days before leaving for the nation's capital. "We have yet to pay reparations for hundreds of thousands of African-Americans dragged here in chains and forced into slavery," he said. "Long dormant bombs and anti-personnel devices continue to kill across Southeast Asia. "Agent Orange persists, affecting the lives of unborn children," he said. "When will we ever learn?" Survivors include his wife of 28 years, Mary Biggie Beyer; three daughters, Liz Beyer Partin, Amy Rodriguez and Bridget Baumer; and a son, Brian Fitzgerald. "The last words he spoke were 'I love you,' " Biggie Beyer said.